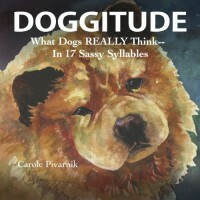 A very sweet book showcasing the inner musings of 36 dogs, in haiku form, with a watercolor painting accompanying each poem. I read this on my Kindle and then re-read it in the Amazon Cloud Reader so I could view the paintings in color. Definitely recommended for dog-lovers, but I think any animal-lover would enjoy this book.